The hotel and restaurant complex "Marine PEGAS" is located on the first line of the sea coast in the village. Iron Port, near the Black Sea Biosphere Reserve, one of the largest in Ukraine. 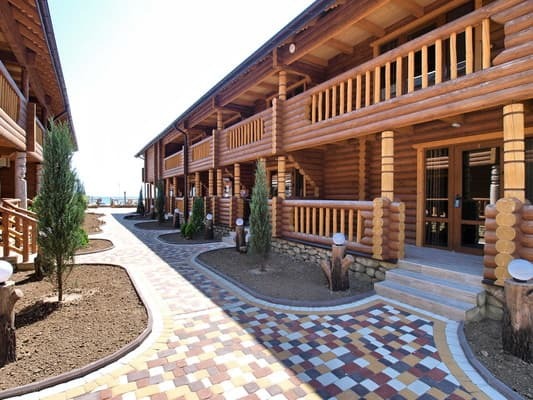 Maritime PEGAS is a brand new hotel of Premium class, decorated in a cozy style of log, conifer and hardwood logs. The main feature of this style are natural, environmentally friendly materials. The hotel has a summer terrace with tables and a barbecue area where you can enjoy delicious dishes cooked on the grill. 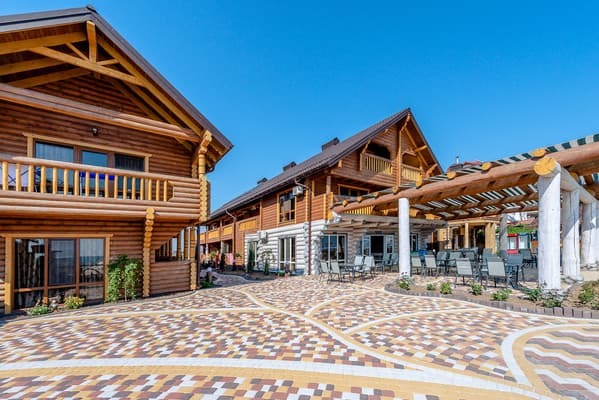 At the main entrance is a restaurant for a wonderful outdoor recreation near the Black Sea coast. Facility's menu is diverse European and Home-style cuisine, varieties of juicy kebabs and various delights cooked on the grill. For lovers of bathing, the hotel has a sauna with a steam room and a relaxation room. In each room: toilet, shower, LCD TV, digital TV, free Wi-Fi, refrigerator, wardrobes, curtains with full blackout. On the territory there is a free parking. 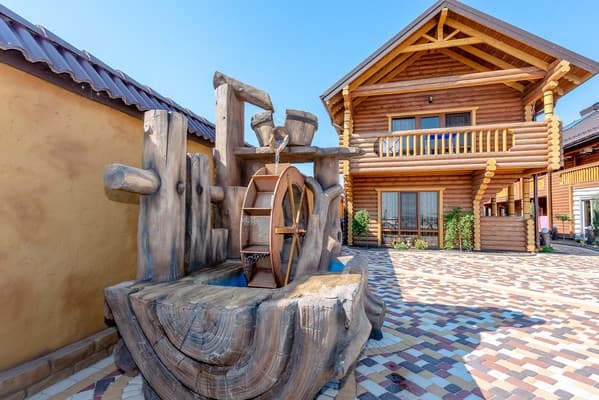 For younger guests, there is a playground with a children's house, a trampoline, a watermill, a sandpit and other entertainment. One of the advantages of the Morskoy PEGAS hotel is its location. We are on the first line of the Black Sea coast. 1 meter to the beach !!! 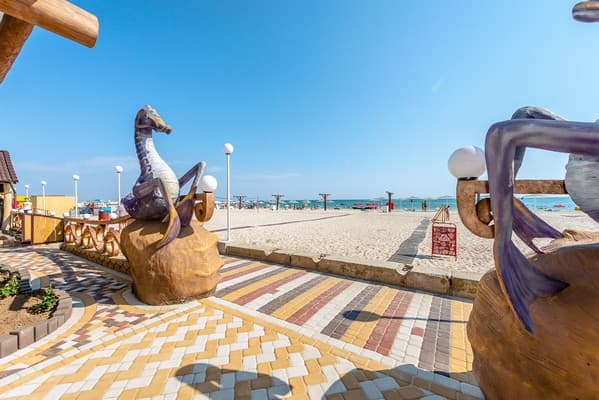 The famous sandy beach of Zhelezny Port is very popular among holidaymakers and tourists, especially among couples with children. The swimming season here begins in May and ends at the end of September. The boundless expanse of the sea will truly heal and calm you. This is the perfect place for a family holiday. Come and see for yourself! Description of the room: Spacious and elegant room, designed in the interior for a comfortable double occupancy. This category of rooms is located on the second floor of the central building. The pleasant microclimate created by coniferous trees will appeal to visitors of the hotel. Comfortable room is equipped with individual air conditioning, cable TV, refrigerator. 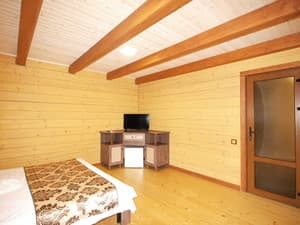 The rooms are furnished with wooden furniture. The bathroom has a shower. The average room size is 25 sq.m. Description of the room: Spacious and elegant room, designed in the interior for a comfortable double occupancy. This category of rooms is located on the first floor of the central building and has a spacious, individual terrace for relaxation. 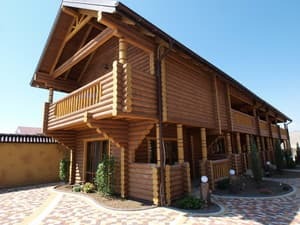 The pleasant microclimate created by coniferous trees will appeal to visitors of the hotel. Comfortable room is equipped with individual air conditioning, cable TV, refrigerator. 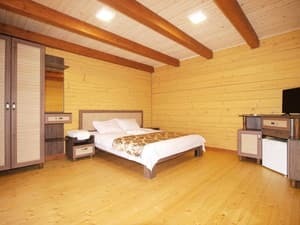 The rooms are furnished with wooden furniture. The bathroom has a shower. The average room size is 25 sq.m. Description of the room: For lovers of classic rest, at the disposal of the hotel complex, there are spacious and elegant rooms, located in a stone building for a comfortable two to four local accommodation. This category of rooms is located on the second floor. Comfortable and spacious room equipped with individual air conditioning, cable TV, refrigerator. 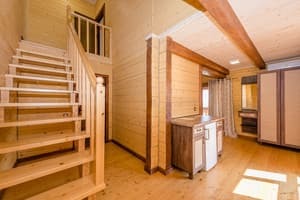 The rooms are furnished with wooden furniture. The bathroom has a shower. The average room size is 35 sq.m. Description of the room: Exquisite, luxurious, spacious and elegant 2-floor room, made of environmentally friendly, natural materials for the most comfortable accommodation. The pleasant microclimate created by coniferous trees will appeal to visitors of the hotel. Comfortable room is equipped with individual air conditioning, cable TV, refrigerator. 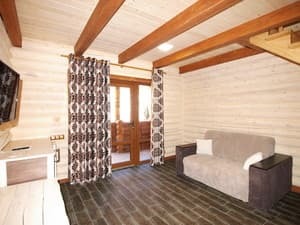 The rooms are furnished with wooden furniture. The bathroom has a shower. The room consists of 2 floors, on the second floor of which there is a huge 2-bed, the first floor is equipped with a comfortable sofa bed. This room has a spacious balcony and a terrace for relaxing. The average room size is 60 sq.m. Description of the room: Majestic 2-storey suite, emphasizing the special status and luxurious lifestyle. 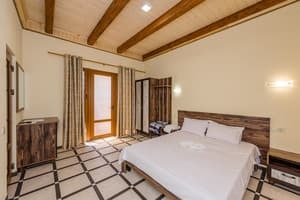 The unique interior of the room is made of environmentally friendly, natural materials for an incredibly comfortable accommodation. The room has two sleeping areas with comfortable double beds. This room has two spacious balconies with a romantic view of the Black Sea. Comfortable room is equipped with individual air conditioning, cable TV, refrigerator. 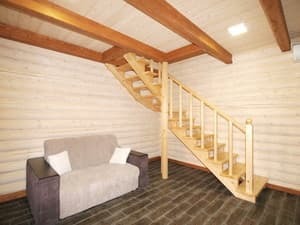 The rooms are furnished with wooden furniture. The bathroom has a shower. The average room size is 67 sq.m. Exclusive Suite - the perfect atmosphere for relaxing by the sea. Description of the room: Exquisite, with a magnificent view of the Black Sea, a spacious and elegant 2-storey room, made of environmentally friendly, natural materials for the most comfortable accommodation. The pleasant microclimate created by coniferous trees will appeal to visitors of the hotel. Comfortable room is equipped with individual air conditioning, cable TV, refrigerator. The rooms are furnished with wooden furniture. The bathroom has a shower. The room consists of 2 floors, on the second floor of which there is a huge 2-bed, the first floor is equipped with a comfortable sofa bed. This room has a spacious balcony overlooking the Black Sea. The average room size is 65 sq.m. Check arrival: from 14:00 - 00:00 hours. Check leaving: to 00:00 - 11:00 hours. The hotel and restaurant complex “Morskoy PEGAS”, if necessary, provides additional space on the euro - folding bed. The hotel has a summer terrace with tables and a barbecue area where you can enjoy delicious dishes cooked on the grill. 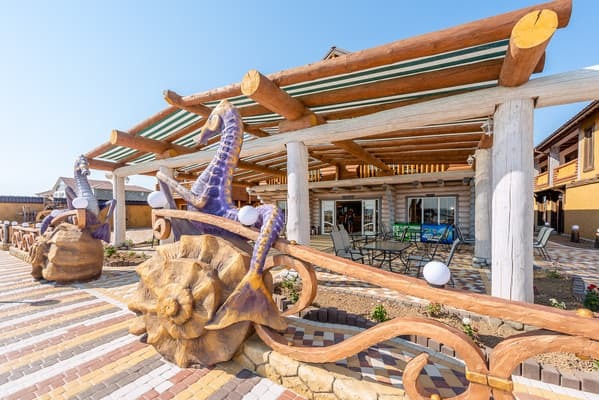 At the main entrance is a restaurant for a wonderful outdoor recreation near the Black Sea coast. Facility's menu is diverse European and Home-style cuisine, varieties of juicy kebabs and various delights cooked on the grill. By air or rail service to Kherson, by bus (fixed-route taxi) with a message to Zhelezniy Port.